At first glance, The Messenger looks like any number of pixel-art projects trying to recreate the magic of decades-old games. Beneath the nostalgic presentation, however, lies an action platformer focused on not just reliving the past but also improving on it. Sabotage Studio, located in Quebec City, is developing it based on the Ninja Gaiden game designer Thierry Boulanger has been wanting to make ever since he was eight years old. The game starts out as a straightforward 2D side-scroller where you zig-zag through maze-like levels infested with demons but eventually turns into something else, with portals that transform the world from 8-bit to 16-bit and add backtracking and puzzles for more layers of complexity. In this respect it tries to do what Fez’s point-of-view shifting trick did for Super Mario Bros. except for games like Ninja Gaiden and Castlevania instead. “It was built over many years,” said Boulanger during a Skype call. “There wasn’t the 8 to 16-bit switch at first it really was just about a character carrying a scroll—this idea of going behind enemy lines and you just have to carry it to this mountain.” From there it grew into something more circular. 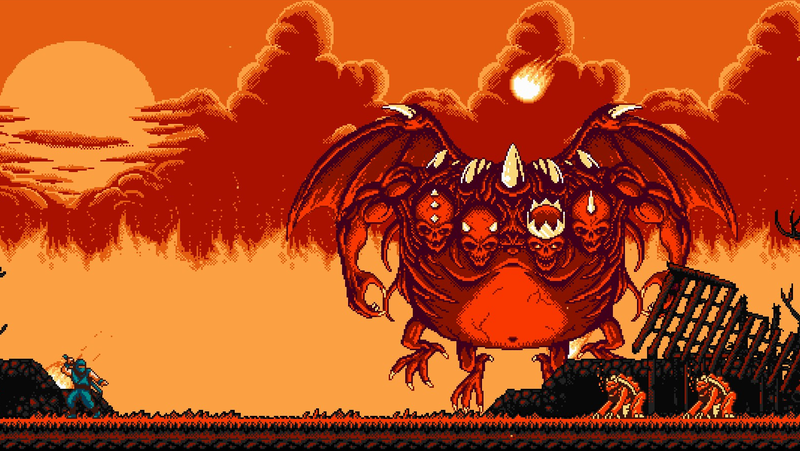 In the mythology of the game’s world, the cycle of demons attacking humanity and a hero carrying a magic artifact on a journey to defeat them is a cyclical event. However, that logic began to take on a figurative dimension with the incorporation of the 16-bit parts in which areas the player has previously explored take on a different complexion and make it possible to access new paths. The Messenger doesn’t just embrace chiptunes and pixel art for nostalgia’s sake, it’s also recycling them as part of a story about creation and destruction where the old is recycled and reformed into something that feels distinctly new. Playing the first several levels of the game, it’s clear Sabotage has managed to do the same with The Messenger. You jump in tight arcs and grapple up and down walls with even more consistency than the classic games that inspired it. There’s also a cloud step mechanic that allows you to initiate another jump mid-air immediately after striking something with your sword, whether it’s another enemy or simply a lantern hanging innocuously in the middle of the screen. As a result, while dashing through a level striking at enemies and flipping over spikes and bottomless pits feels intuitive and almost effortless. But that’s as much a testament to how the game balances moments of hyper-control with a complete lack of it as anything else. “In general we removed most of the friction like say you’re running and you attack it doesn’t slow you down or if you’re attacking and you jump you jump right away the attack animation doesn’t finish before that,” said Boulanger. We use those conrols to then play a bit more with gravity.” Every action in the game is punctuated by brief moments where the game takes over—at the top of a jump or after getting hit by an enemy—each of which is immediately followed by the possibility of regaining control, either by slashing at a nearby demon or slamming the analog stick upwards to cancel a knock-back animation. The pleasure of navigating a level in The Messenger then isn’t so much about seamlessly enacting your will as much as it is about finding the right balance and hitting the right beats, similar to a rhythm game. In this regard the studio expects the game to be popular with speedrunners and has gone out of its way to try and design levels with that sort of highly optimized play-style in mind. This thinking itself sprang from Boulanger’s years as a kid beating Ninja Gaiden 2 hundreds of times. It’s easy to see someone growing up now doing the same thing with Sabotage’s game. What I was able to play certainly spoke to that intent. Everything in the game seems focused on propelling you forward and inviting you to learn and employ your increasing skill with the limited maneuvers at your disposal in able to do so. The game has an upgrade tree for things like defense and the number of shurikens you can hold and other abilities you gain along the way like gliding and grappling hooks, but it never seems to stray too far from twitchy platforming at its core. The wonderful retro music, pixel graphics, and 16-bit twist that happens later on all just help to deepen the appeal of the game’s streamlined mechanics and feel. Currently Sabotage is aiming to release The Messenger on PC this summer and hopes to bring it to consoles eventually as well.